“Owning our story and loving ourselves through that process is the bravest thing we´ll ever do.” I still believe in this quote from two of my previous books-maybe now more than ever. But I know that it takes more than courage to own your story. We own our stories so we don´t spend our lives being defined by them or denying them. And while the journey is long and difficult at times, it is the path to living a more wholehearted life. Just because someone isn´t willing or able to love us, it doesn´t mean that we are unlovable. Longing is not conscious wanting; it´s an involuntary yearning for wholeness, for understanding, for meaning, for the opportunity to regain or even simply touch what we´ve lost. Longing is a vital and important part of grief, yet many of us feel we need to keep our longings to ourselves for fear we will be misunderstood, perceived as engaging in magical or unrealistic thinking, or lacking in fortitude and resilience. Regret is what taught me that living outside of my values is not tenable for me. Regrets about not taking chances have made me braver. Regrets about shaming or blaming people I care about have made me more thoughtful. Sometimes the most uncomfortable learning is the most powerful. Revolution might sound a little dramatic, but in this world, choosing authenticity and worthiness is an absolute act of resistance. Choosing to live and love with our whole hearts is an act of defiance. You´re going to confuse, piss off, and terrify lots of people -including yourself. One minute you´ll pray that the transformation stops, and the next minute you´ll pray that it never ends. You´ll also wonder how you can feel so brave and so afraid at the same time. At least that´s how I feel most of the time… brave, afraid, and very, very alive. If you´re lonely this one´s for you. What does it feel like to be lonely? It feels like being hungry: like being hungry when everyone around you is readying for a feast. It feels shameful and alarming, and over time these feelings radiate outwards, making the lonely person increasingly isolated, increasingly estranged. It hurts, in the way that feelings do, and it also has physical consequences that take place invisibly, inside the closed compartments of the body. If I could have put what I was feeling into words, the words would have been an infant wail´s: I don´t want to be alone. I want someone to want me. I´m lonely. I´m scared. I need to be loved, to be touched, to be held. If they had earlier been lonely, they now have no access to the self that experienced the loneliness; furthermore, they very likely prefer that things remain that way. In consequence they are likely to respond to those who are currently lonely with absence of understanding and perhaps irritation*. *Robert Weiss, Loneliness: The Experience of Emotional and Social Isolation. Loneliness profoundly affects an individual´s ability to understand and interpret social interactions, initiating a devastating chain-reaction, the consequence of which is to further estrange them from their fellows. When people enter into an experience of loneliness, they trigger what psychologists call hypervigilance for social threat (…). In this state, which is entered into unknowingly, the individual tends to experience the world in increasingly negative terms, and to both expect and remember instances of rudeness, rejection and abrasion, giving them greater weight and prominence than other, more benign or friendly interactions. This creates, of course, a vicious circle, in which the lonely person grows increasingly more isolated, suspicious and withdrawn. If you are not being touched at all, then speech is the closest contact it is possible to have with another human being (…). The irony is that when you are engaged in larger and more satisfactory intimacies, these quotidian exchanges go off smoothly, almost unnoticed, unperceived. It is only when there is a paucity of deeper and more personal connection that they develop a disproportionate importance, and with it a disproportionate risk. That loneliness can derive from the conviction that there is no person or group to which one belongs. This not belonging can be seen to have a much deeper meaning. However much integration proceeds, it cannot do away with the feeling that certain components of the self are not available because they are split off and cannot be regained. Some of these split-off parts… are projected into other people, contributing to the feeling that one is not in full possession of one´s self, that one does not fully belong to oneself or, therefore, to anybody else. The lost parts too, are felt to be lonely. The way I recovered a sense of wholeness was not by meeting someone or falling in love, but rather by handling the things that other people had made, slowly absorbing by way of this contact the fact that loneliness, longing, does not mean one has failed, but simply that one is alive. Loneliness is collective; it is a city. As to how to inhabit it, there are no rules and nor is there any need to feel shame, only to remember that the pursuit of individual happiness does not trump or excuse our obligations to each another. We are in this together, this accumulation of scars, this world of objects, this physical and temporary heaven that so often takes on the countenance of hell. What matters is kindness; what matters is solidarity. What matters is staying alert, staying open, because if we know anything from what has gone before us, it is that the time for feeling will not last. Este libro estaba en una estantería de un centro de salud del que ya he hablado aquí. De ese mueble cualquier persona puede coger y dejar libros. Gratis y sin compromisos. Pensar rápido, pensar despacio estaba allí como si hubiera salido de la imprenta unos minutos antes. Me llamó tanto la atención que alguien quisiera deshacerse de un libro en apariencia tan valioso que pensé que debía de tratarse de un médico de los que suelen despreciar las disciplinas científicas que no sean las de su especialidad. En este libro se han descrito las operaciones de la mente como una difícil interacción entre dos personajes ficticios: el automático Sistema 1 y el esforzado Sistema 2. […] “El Sistema 1 hace X” es una forma de decir que “X se hace automáticamente”. Y “el Sistema 2 es movilizado para hacer Y” es una forma de decir que “la mente se aviva, las pupilas se dilatan, la atención se centra y se ejecuta la actividad Y”. Mi Sistema 1 ficticio llegó a la conclusión automática de que el libro era valioso (sin haberlo leído) y de que la persona que lo abandonó era médico. Kahneman me explicaría los mecanismos a través de los cuales llegué a esos juicios y me recomendaría pensar algo más la próxima vez, teniendo en cuenta que la racionalidad famosa del Sistema 2 tiene capacidades limitadas. El Sistema 1 es sin duda el origen de mucho de lo que hacemos mal, pero también es el origen de gran parte de lo que hacemos bien, que es la mayor parte de lo que hacemos. […] La manera de bloquear los errores que origina el Sistema 1 es en principio sencilla: reconocer las señales de que estamos en un campo cognitivo minado, detenernos y pedir refuerzos al Sistema 2. 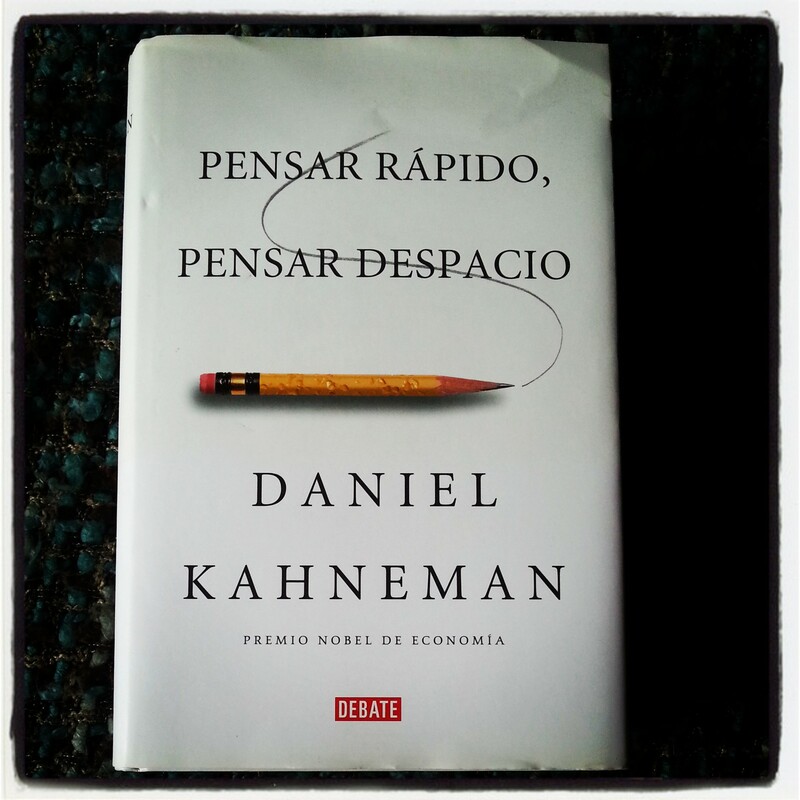 Finalmente, Kahneman me recomendaría su libro, una exposición brillante de su teoría de los dos sistemas y de su aplicación en el ámbito económico y yo reconocería su gran mérito divulgativo y mi incapacidad para comprender ciertos aspectos de su discurso. Y concluiría que lo único que he aprendido es a permanecer alerta ante las minas.